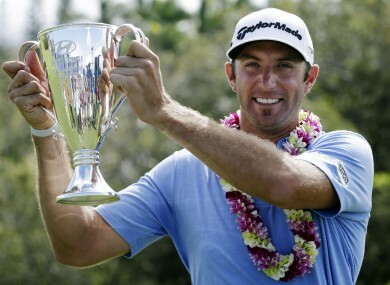 Dustin Johnson got his 2013 season off to a perfect start with a win at the Hyundai Tournament of Champions last night. Johnson: four-stroke winner in Hawaii. DUSTIN JOHNSON CAPTURED the PGA Tour’s season-opener late last night, firing a five-under 68 to win the weather-shortened Hyundai Tournament of Champions. The big-hitting 28-year-old swept the 54-hole event by four strokes, finishing on 16-under-par for his seventh PGA Tour title. The tournament was originally supposed to conclude on Monday, but high winds prevented any rounds from being completed from Friday through to Sunday on the par-73 Plantation Course at Kapalua. Extreme conditions then forced organisers to shorten the tournament to 54 holes, with 36 holes taking place in an extended Monday session. Johnson headed into the final round with a three-shot lead over defending champion Steve Stricker. Stricker had to battle through a nerve problem in his upper thigh, but shot a 69 and finished alone in second place at 12-under. “He came back strong, I knew it was going to be tough today but I gave him a bit of a run for a while,” Stricker said of Johnson. Email “Season's greetings: Johnson clinches win in weather-bashed Hawaii”. Feedback on “Season's greetings: Johnson clinches win in weather-bashed Hawaii”.